Port of Wilmington Cold Storage (PWCS) is a new cold storage warehouse facility containing roughly 3 million cubic feet, located directly on terminal on the Port of Wilmington, NC. This is the only cold storage facility located on a port in the State of North Carolina. 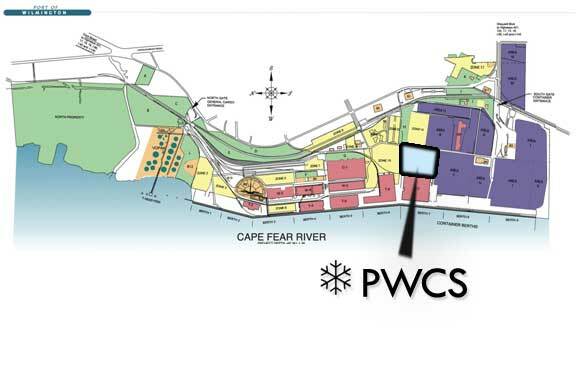 PWCS’s strategic location on the Port of Wilmington provides our import and export customers with logistical benefits. PWCS is a full-service, public refrigerated warehouse operation with roughly 11,000 pallet positions. We are now a Customs and Border Protection approved warehouse as well as a Bonded warehouse. Our facility is located near ideal distribution channels including water, interstate, and rail. PWCS has the resources and experience to store, ship and stage your products at competitive rates in all the markets we serve. Our people are experienced and our systems are best-in-class.